Let’s reflect for a minute on what we used to do before smartphones existed. Getting from point A to point B required we print off directions or rely on a paper map. Contacting a business to check its hours meant we’d have to pull out the hefty Yellow Pages book to look up the phone number. Going to see a movie meant retrieving the morning newspaper to decide between cinema times. And spending time with loved ones meant you actually had to be present instead of checking your phone 20 gazillion times. Fast forward to today, and we do everything with our smartphones. They’re surgically glued to our hands. In fact, a recent study revealed the average person clicks, taps, or swipes on their phone 2,617 times…a day. That is no puny number. So, what does this mean for you as an entrepreneur trying to get in front of customers with your product or service? It means you need to get with the times and start optimizing your copy for a better mobile experience. But, that’s no easy feat. Where do you even begin to tackle such a task? Don’t worry one bit. 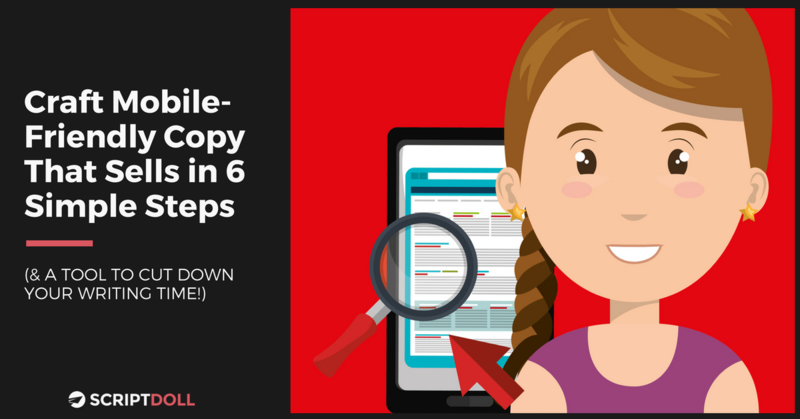 Today, I’m giving you six key ways to craft mobile-friendly copy, setting you up for success to reap impressive conversions. Even after having these tips in your back pocket, however, it’s still tricky (and tedious) understanding where to start in writing copy for your product or service. I get it; it’s easier for you to talk about your offering versus write about it. Luckily, I’ve got just the solution you need to save you some serious time and craft copy that actually sells. Keep your eyes open for more information below! 1. Treat headlines like shortened versions of tweets. The longer your headline, the greater amount of space it takes up on a mobile page. Yes, it might be slightly easier on the eyes when viewing it on your desktop, but that’s certainly not the case for smaller screens. Consider it your teaser to your content. And, in order to make the best use of it, it needs to be a short burst of awesomeness. Hook onto your audience’s attention and propel them to stick around. One of the best in the biz at doing just that is Apple. You’re probably thinking…yeah, of course they are. They have a dream team of expert copywriters at their disposal. But, hear me out. We can all learn something from this innovative tech company. Check out an example of one of its current headlines. It’s visually appealing for both desktop and mobile. Plus, it’s short, sweet, and plays on a new feature of its most updated MacBook Pro. It catches my attention for sure. Best of all? The call to action is strategically placed after the headline, sprinkling in the perfect amount of information that excites me to learn more. What do you think? File this example away in your memory bank to copycat the style for your headlines from this point forward. In being clear and concise with your content “teaser,” you’ll let your audience know exactly what it is you’re offering up while presenting a hint of mystery to lure them in. 2. Front load your most important content. When it comes to mobile, you’re working with a very small amount of real estate and your audience’s short attention. For that reason, you need to get to the point, and fast. Don’t wait until the tail end of the page to reveal some critical component of your offer. According to Nielsen Norman Group, “Users don’t scroll for fun. They scroll for a purpose.” So, load up all your enticing copy and drop it in at the top, convincing your audience within the first few seconds you have just what they need. Once they know they’re in the right place and you have something of value to them, they’ll start scrolling and read what else you have to say. What content should you put front and center? The really, really colorful stuff. Your primary offer—you know, the thing that addresses your customer’s biggest pain point(s). Then, follow that with what makes you unique—your why. And don’t forget to sprinkle in some social proof! For example, the number of happy customers you’ve helped to date. Check out how QuickBooks is utilizing this strategy. At first glance, I see a 5-star review from a customer, a CTA to check out how the software works, and a statistic telling me how much time it can save me each month. This is all before I’m forced to start scrolling. When you implement a strategy similar to this, it’ll be easier for you to close the loop and avoid conversion leaks. Get rid of all the fluff and filler. Don’t just throw random jargon on a page to fill space. Why? Because we both know our attention spans are extremely short. Start speaking a different language and your people will not waste any time running far, far away from the engagement you were hoping for. Feeling lost as to what is considered fluff and filler? Check out SmartBlogger’s list of 297 flabby words and phrases hijacking the juicy power of your sales copy. But, don’t go cutting a ton of words just yet. And don’t think you need to shorten your sales pages—long-form sales copy is still alive and well. You simply need to tighten up your content. At the same time, ensure you’re still communicating what you believe your audience wants (and needs) to know about your product or offering, persuading them to take the next step. 4. Turn formatting into your best friend. The last thing you want to do after working hard to reel your audience in is force them to scroll aimlessly through heaping piles of words. You’ll lose them real quick! Steer clear of that hurdle, however, by keeping your content more like a snack and less like an 8-course meal. This is where line breaks, bullet points, numbered lists, and checklists come in. Line breaks help maintain an attractive level of white space and give your audience breathing room while digesting your content. And bullet points, numbered lists, and checklists help get the message across in bite-sized pieces. Check out how Blue Apron, a meal delivery service, puts this strategy to good use. Thanks to its short and sweet checklist, I immediately know what to expect in my delivery. Easy peasy! Once you begin to incorporate formatting, you’ll avoid giving your mobile audience some serious indigestion. 5. Stick with a tempting, easy-to-click call to action. Don’t let it get buried among all your other content. A call to action (CTA) button that’s placed “above the fold” (aka before the scrolling begins) is said to generate greater conversions. Think if you were the customer… would you want to keep scrolling back and forth to find the darn button to take action? Nope? Didn’t think so. Stop placing it at the very bottom of the page and also thinking you’re limited to only one button. You won’t be dodging protocol if you place multiple buttons for the same offer throughout the length of your sales page. Check out how MailChimp, an email marketing service, utilizes this strategy—first image is from the very top of its homepage and second image is from the very bottom. And the copy inside the button is just as important. MailChimp knows what’s up using that lovely “F” word. You know the one…FREE. A plain Jane “Click here” or “Learn more” won’t do much, if anything, for you. Make it appealing to your audience. In fact, so appealing to the point they don’t want to wait any longer to jump on your product or service’s train, departing from their biggest headaches. Oh, and please be sure the average thumb can actually click on the button. It’s no fun discovering you must pinch the screen to scroll in when you’re finally ready to hit that far-reaching CTA button to take you to the next step. 6. Test, and test again. As with anything in the marketing world, mobile technology is changing at a rapid pace. What works for you today might not work for you in a month. That being said, don’t let your content sit and rot after you feel the hard work is behind you. Consider using A/B testing and heat map tracking to monitor the areas your audience is most focused on and what’s driving the most conversions. And, don’t dilly-dally putting yourself in your customer’s shoes. Test your sales pages for yourself on a mobile device and invite a few of your peers to do the same. Is the content easy to read? Are the links/buttons easy to click? Does the content load quickly? The list could go on. Take your time in testing, and don’t skimp on this—go all out. After all, you want to be sure you’re doing things right because the mobile tipping point is here. Still stumped on how to quickly and efficiently write copy that sells? You have the game plan you need to successfully craft mobile-friendly copy. Now it’s time to get to work and begin the writing process. Easier said than done, am I right? Well, I’m here to help you put an end to spending gobs of time copywriting and feeling frustrated when you don’t get the results you expected. How? With ScriptDoll, your new software companion. It’s a sales copy engine dedicated to assisting you with composing persuasive sales content in minutes. Once you create your product portfolio and answer a handful of painless questions, ScriptDoll drops those answers into thoughtfully crafted content scripts that sell—sales letters, email sequences, you name it. Whether your audience is on their desktop, tablet, or even smartphone, the content goes the whole nine yards. Offers access to an ever-growing library of content templates—no matter what type of copy you’re needing, a variety of scripts are at your disposal from sales letters to email sequences, video sales scripts, native ads, and much more. Not to mention, new templates are added on a monthly basis, ensuring your audience won’t get tired of hearing the same thing from you over and over again. Keeps your copywriting in house—there’s no need to spend thousands of dollars outsourcing your writing tasks to copywriters. ScriptDoll’s content-rich templates are crafted for you thanks to its partnerships with first-class copywriters around the world. Sounds amazing, right? Well, stop dreaming about what your life would be like with this software and turn it into your reality. You’re finally familiar with what it takes to write mobile-friendly copy, and ScriptDoll will handle the rest—producing content that your audience can’t help but notice. Get Your Lean Mobile-Friendly Copy in Minutes! Optimizing content for the world of mobile is no longer optional. But, now you know some key copywriting tips and best practices to apply right away to appeal to your smartphone audience. Not to mention, a tool to help you craft concise copy that sells in minutes, improving your marketing productivity and results. So, what are you waiting for? Go on and join your fellow entrepreneurs who are finding success with ScriptDoll! You’re just a click away from getting noticed on the small screen. Cut Down Your Writing Time in Minutes – Join ScriptDoll!